Whitney and Ben had a very specific and clean-cut vision for their Chicago wedding. When searching for the perfect fit for their perfect day, Whitney stumbled upon Azazie. Our colors ended up being exactly what she was looking for and tied together their whole color scheme, creating the whole-package look that they wanted to enjoy with their loved ones. Their beautifully modern and personal day was everything they could have hoped for. All photos courtesy of Christy Tyler Photography. Q: What location did you pick to have your wedding and why did you choose this place? 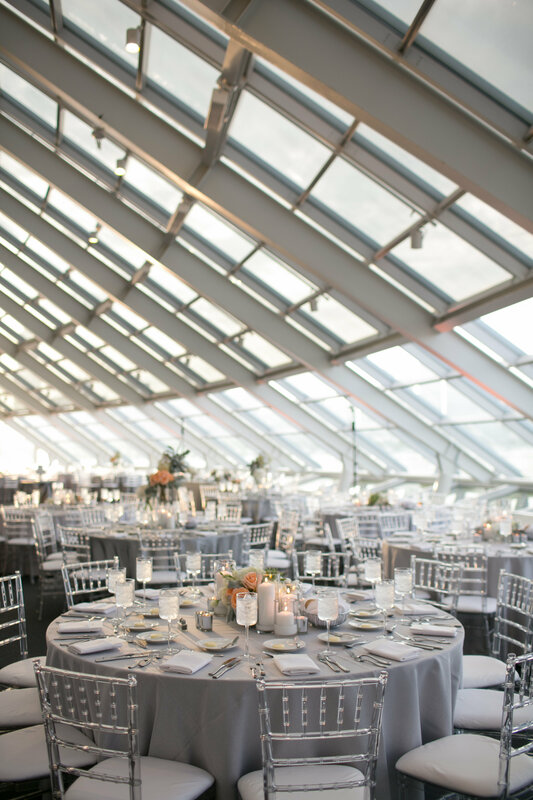 We had our wedding ceremony and reception at the Adler Planetarium in downtown Chicago. We chose the Adler Planetarium because we wanted to share one of our favorite views of the city with our guests, most of which were from out of state. Q: Did you have a particular theme or color scheme? Is there a story behind this color theme and why you chose it? 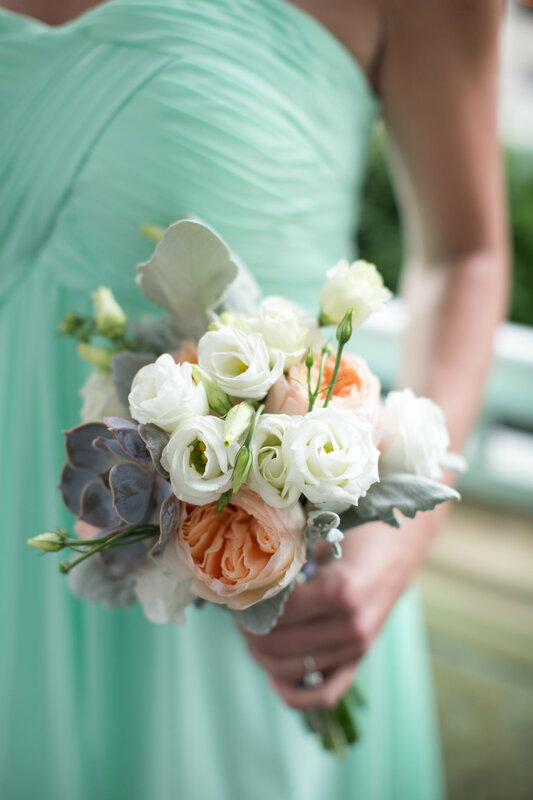 Our color scheme was mint and peach, with silver accents. I’ve always been drawn to the combination of mint and peach and love how they complement each other. The best part of our wedding day was being surrounded by all our family and friends, the people that mean the most to us. We were surrounded and overwhelmed with love and support all day. I was so happy when I found Azazie for my bridesmaid dresses. 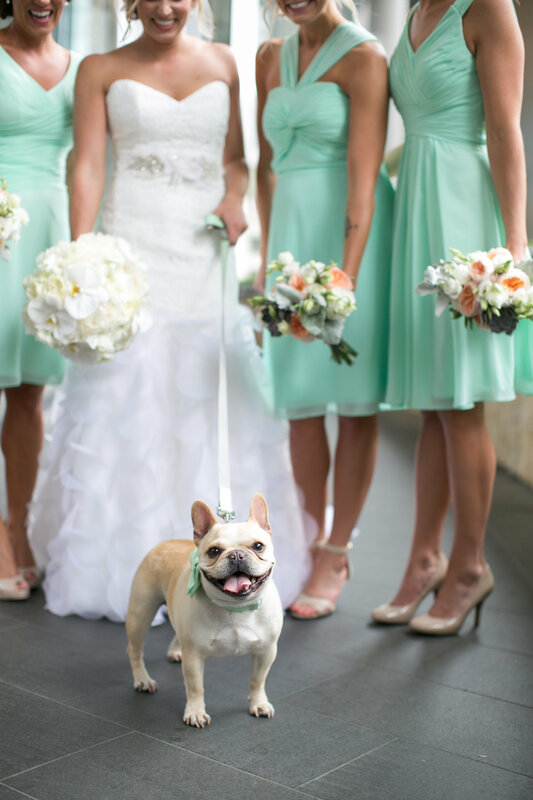 I had a specific shade of mint in mind before I started my search for bridesmaid dresses. It turns out there are many different shades of mint out there, none of which were what I was looking for. Then I found Azazie and fell IN LOVE with the mint color. It was exactly what I was envisioning. I also knew I wanted to let my girls each pick a style of dress they felt comfortable in and that matched their personalities, and I was happy to find out Azazie had a huge selection for them to choose from! Hire a day-of coordinator and a videographer. Expenses can pile up quickly when you are planning a wedding, and these are two vendors are often viewed as “optional”. Hire a day-of coordinator so you can enjoy the day with your family and friends without worrying about anything. Hire a videographer because as beautiful and sentimental the pictures will be, there is just something special about having the video. It is fun to watch and relive moments from throughout the day. We made it a point to enjoy every step of the wedding planning process, because if you don’t choose to enjoy it – it can quickly become very overwhelming. We did our best to get everyone involved in the process somehow, which brought us closer to our family and friends. Q: Where did you find/hear about Azazie? After my search for the perfect bridesmaid dresses in Chicago failed, I turned to Google for help. Luckily I stumbled across Azazie through my internet searches, and I couldn’t be happier that I did! I found the perfect mint color I had in mind, and loved the wide range of styles to choose from. Q: And when asked to give one word to describe their wedding day?